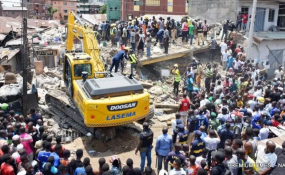 With the operatives of the Lagos State Emergency Management Agency (LASEMA) getting to ground zero at the three-storey residential building that collapsed at Ita-Faji area of Lagos Island, rescue operations were Thursday halted. THISDAY gathered that the fatality figure was pegged at 14, following the latest recovery of a middle-aged man about 3a.m. yesterday, who was buried underneath the rubble on the ground floor. As at press time, however, there were conflicting figures about the survivors, with most of the emergency agencies declining to clarify the status of the living and the dead. According to them, their reluctance to put a figure to the fatality and casualty rates was because some of the survivors who were brought out alive later died, adding that primary responders (neighbours) already carried out some rescue work before the professionals came. While debunking claims that people were still trapped, the General Manager, Lagos State Emergency Management Agency (LASEMA), Mr. Tiamiyu Adesina, said operations have been concluded. He said the operation was wrapped up after the last body was brought out by 3a.m., adding that the machines reached ground zero and so rescue work was called off. He added that their reluctance to reel out figures was to avoid giving conflicting reports, which was why they are waiting for the ministry of health to harmonise the figures. Some heavyduty vehicles have been mobilised to the site to clear out the remaining debris, thus signalling the final stage of rescue work. Meanwhile, despite assurances by the state Governor, Mr. Akinwunmi Ambode, and his deputy, Dr. Idiat Adebule, that there would be free medical treatment for the survivors, the reverse seems to be the case. This is because the families of the survivors Thursday besieged the hospital, demanding that treatment be given to their loved ones free of charge. They alleged that most of them were asked to pay so that treatment would be continued, an allegation the hospital has since denied. While protesting the alleged demands of the hospital, the affected persons blocked the hospital's entrance as they made their demands known. Already, some free-spirited individuals and organisations have kicked off a donation campaign to make some of the essentials needed by the survivors available. Asides the ongoing call for voluntary blood donation, organisations like Health Hub Africa in conjunction with Heal for Africa Initiative, have called for wheel chairs, walking frames, crutches and underlays. Meanwhile, as part of measures put in place by the federal government, a team was sent to make post disaster assessment, which will lead to providing relief assistance in various capacity to the victims. According to the Director of Search and Rescue, National Emergency Management Agency (NEMA), Air Commodore Akugbe Iyamu, the assessment was to know the extent of damages and look at preventive mechanisms that can jointly be adopted by the state and federal government to forestall frequent occurrence of such incident in the future. He also visited the survivors at the Mainland General Hospital to commiserate with them, their families and the state government. He assured the relations of the victims that the federal government was working with the state officials to look at the ways that NEMA could be of further assistance to the victims. The assistance, he said, will take care at the pre and post disaster recovery state of the victims that will enable them overcome the initial trauma and kick start them back to normalcy. There were indications yesterday that the state government would make good its promise to demolish structurally defective buildings, as well as conduct integrity tests on other buildings in the area. It was gathered that the demolition would begin with those that were previously marked but were abandoned before the building collapse happened. Still on the deteriorating state of buildings in the area, President, Building Collapse Prevention Guild (BCPG), Kunle Awododu, lamented that there are over a thousand buildings unfit for habitation on the island. Also at the scene of the building collapse was the Lagos State governor-elect, Mr. Babajide Sanwo-Olu, and his deputy, Mr. Hamzat Obafemi, for an on-the-spot assessment. According to Sanwo-Olu, they came to console families of the victims, while promising that government would leave no stone unturned to ascertain that all involved are rescued. He also commended the efforts of all the agencies working on the project, just as he begged the community members to give them maximum cooperation.